It may seem surprising that I chose Germany as a stop on a world tour of geothermal resources. The country certainly doesn’t top the list of geothermal producers worldwide, generating only 40 MW of power (for comparison, the US generates ~3500 MW). However, for several reasons, the sector is poised to grow, and they are leading the way in a lot of research. Germany does not possess the attention-grabbing high-temperature geothermal resources like those in Iceland, the United States, or New Zealand. There is no active volcanism and the country is not directly situated on an active plate boundary. However, geothermal potential does exist, and there are several geological similarities with Canada, particularly between the sedimentary basins, that make it worthy of a visit. There is an appetite for renewable energy in Europe, and in the wake of the 2011 nuclear meltdown at Fukushima, Germany has opted to phase-out nuclear power plants. Other renewable energy sources are required to fill the void, geothermal among them. The German federal government has incentivised geothermal development with a “feed-in tariff”, which makes geothermal development more economically feasible and attractive. This subsidy will theoretically decrease over time as the cost of the technology decreases and better knowledge of the resource reduces the initial risk of investment. 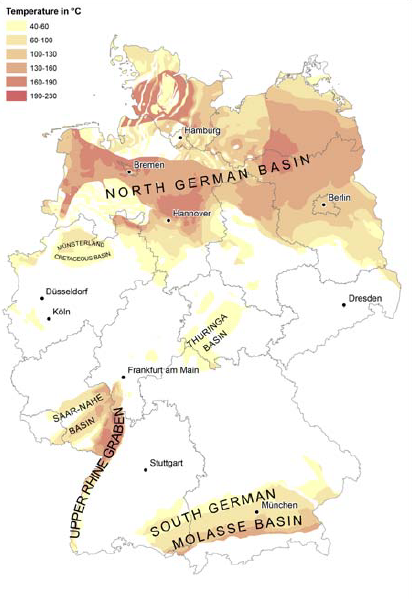 Geothermal resources in Germany are generally found in three regions: the North German Basin, which stretches across most of the northern quarter of the country; the Molasse Basin, which lies at the front of the Alps, surrounding Munich; and the Upper Rhine Graben, a major fault-controlled valley in the southwest. My visit to Germany took me to research institutions and geothermal companies located in all three regions. My goal at each place was to learn about groundbreaking geothermal research, get a broad understanding of the regional geology, and draw comparisons with Canada. My visit began with a short conference in Berlin, called Shaping the Future of Energy, held at the Canadian Embassy as part of Berlin Science Week. The conference was organized by the Future Energy Systems program at the University of Alberta, and was designed to showcase some of our work on renewable energy, and to discuss collaboration with German institutions. I presented a poster with some of my preliminary results from last summer’s field work, and watched several talks and a panel discussion on various renewable energy topics. It was a great learning experience overall. From Berlin I travelled to the Karlsruhe Institute of Technology (KIT), located in the southwest corner of Germany. Karlsruhe is located in the Upper Rhine Graben, a NNE-SSW trending rift valley that extends from the foothills of the Alps (Jura Mountains) near Basel, Switzerland, to the city of Frankfurt. The Rhine Graben has a complex history. It’s underlying structure is controlled by pre-existing (~300 Myr old) weaknesses in the crust that were reactivated ~30 million years ago (Eocene) during the continental collision that gave rise to the Alps. Initially, the stress regime favoured pure E-W extension, later shifting to left-lateral transpression and transtension (See figure below). Some authors have argued for an even more complicated stress history. 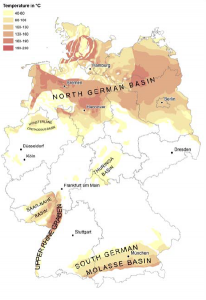 The geothermal reservoirs in the Rhine Graben are heavily influenced by the main boundary faults (i.e., the faults that form the edges of the rift), and it is thus quite important to understand the full tectonic history of these features. 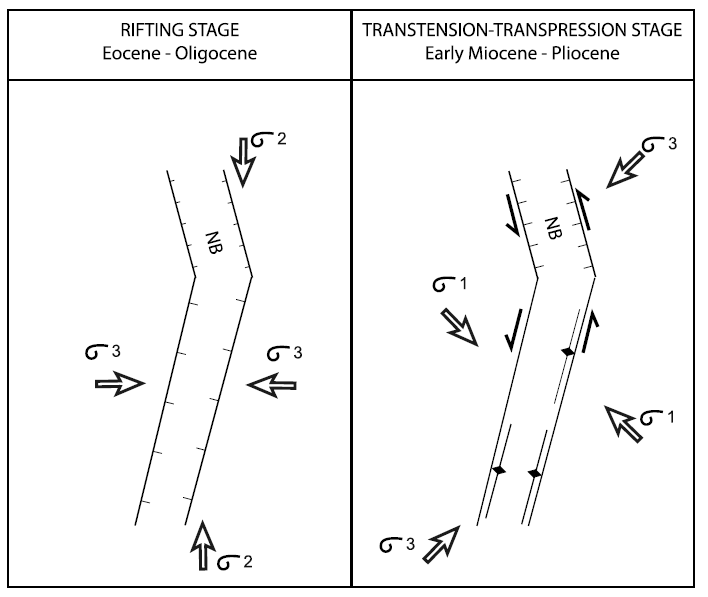 Image: Simplified stress history of the Upper Rhine Graben. Extension in the Eocene to Oligocene took advantage of pre-existing crustal weakness. This was followed by a transition to left-lateral transpression and transtension in the Miocene to Pliocene. Source: Rotstein and Schaming, 2011. Not only is the stress history important to understand – so is the current stress regime, and the influence it has on pre-existing fault planes. Faults that have been recently active tend to be more permeable than those that have had time to get clogged with mineral precipitate. One method we discussed while at KIT is known as “Slip and Dilation Tendency Analysis”, in which a modeled stress regime is applied to a 3D fault model. Faults are considered likely to slip if the effective shear stress is equal or greater than the frictional resistance to sliding; the resistance to sliding depends on the normal stress acting on the fault plane (anyone else having flashbacks from highschool physics?). The likelihood of a fault to dilate is determined based on the relative magnitude of the maximum compressive stress and the normal stress acting on a fault plane; the greater the difference, the more the fault will dilate, allowing fluid to flow. Image: Results from a Slip and Dilation Tendency Analysis performed by Meixner et al., (2016) on 3D fault model of the Bruchsal geothermal system near Karlsruhe. You can see that the WNW-ESE oriented faults are much more likely to slip and dilate, indicating that they may be more favourable fluid paths. While at KIT, I had the opportunity to visit an engineering lab that has been working on a technology that could have significant impact in the geothermal energy industry. 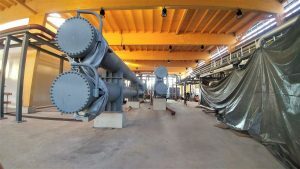 Generally, geothermal reservoirs need to be at or above 100˚C to be used for electricity generation via a steam turbine, but there are a few exceptions to this. In some cases, like at Chena Hotsprings in Alaska, a heat exchanger is used to transfer heat from the sub-boiling water (~73˚C) to a working fluid with a lower boiling point (haloalkane refrigerant R-134a) which goes through the turbine. 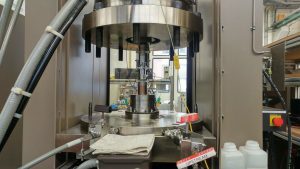 At the University of Alberta, there is ongoing research into the application of Stirling engines to geothermal electricity production at low temperatures (https://sites.ualberta.ca/~dnobes/research_1.html). Particularly in geologic settings like the Western Canada Sedimentary Basin, Molasse Basin, and North German Basin, there are a great deal of hot water reservoirs that don’t quite reach the boiling point. It would therefore allow for much wider development of geothermal energy if we could generate electricity from such reservoirs. 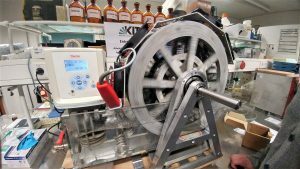 Known as an “entropy wheel” (image below), the machine at KIT consists of an inner and outer wheel held apart by numerous small springs that are made of a special material that shrinks when it is heated (see: http://www.itcp.kit.edu/wilhelm/entropierad.php). As the wheel passes through hot water at the bottom of its cycle, the springs contract, and then expand again when they pass by the cooling fans mounted above the wheel. This variable expansion and contraction causes the center of mass of the outer wheel to be slightly offset from the inner wheel, which drives continuous rotation. This device has the potential to generate electricity from geothermal water well below boiling. Image: Entropy wheel at KIT. In this image the wheel is rotating clockwise. The axis of the outer wheel is offset above and to the right of the inner wheel, driving continuous rotation. Note that the water temperature is <60˚C! My next stop was in the city of Munich, which is located in the southeast corner of Germany, in the state of Bavaria. Munich is located north of the Alps, and sits atop the Molasse Basin, which is comparable in many ways to the Western Canada Sedimentary Basin east of the Rockies. During and following the rise of the Alps in the late Cretaceous to Eocene, up to 6 km of sediments eroded from the mountains were deposited in this basin. In geology, the term “molasse basin” is often broadly applied to a sedimentary basin comprised of mostly terrestrial or shallow-marine river deposits of sandstone and conglomerate shed from a rising mountain range, with the Alpine Molasse Basin being the reference case. Before the development of the Alps, the area was covered by the shallow northern extent of the Tethys Ocean, an ancient sea that separated the supercontinents of Laurasia (now North America and most of Eurasia) and Gondwana (now South America, Africa, India, Australia…). In the late Jurassic (~150 million years ago) a carbonate reef system now known as the Malm Formation covered the sea floor, in places reaching up to 600 m thick. Now deeply buried beneath the Molasse Basin, this geological unit makes for an excellent aquifer, as it has good natural porosity which has been enhanced by the dolomitization process, in which Calcium atoms are replaced with Magnesium, resulting in shrinking of the crystal structure and increase in void space. Below Munich the temperature of groundwater in the Malm exceeds boiling, and only increases with depth to the south. From a sedimentological point of view, the Malm is much more complex than the figure below conveys. Throughout the history of the reef system, varying amounts of clastic sedimentation would have controlled the growth and connectedness of the reef. When sedimentation rate is higher, individual segments of the reef will be more isolated; when lower, the reef would expand laterally and become more connected. In terms of geothermal energy exploration it is preferable to find a large, well-connected part of the reservoir, simply because there is more hot water to access, and less chance of depletion. In general, the Malm is an excellent geothermal reservoir. 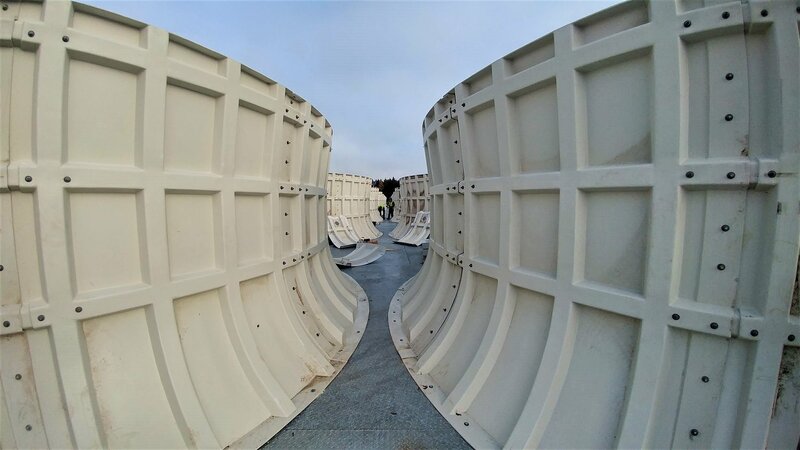 It is highly permeable, laterally extensive, and has low mineral content, which means that corrosion and scaling is less of a concern when constructing power and heating plants. Image: Simplified cross-section of the Alpine foothills and foreland near Munich. The Jurassic Malm formation contains a significant volume of hot water, increasing in temperature to the south. Source: Farquharson et al., 2016. 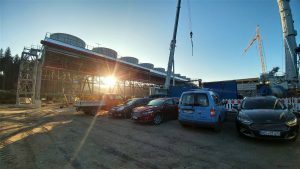 Facing pressure to transition to renewable energy, Munich City Utilities (Stadwerke Munchen) and the municipalities in the surrounding region have been investing heavily in geothermal projects. Many of these cities and towns have historically used district distribution systems to carry hot water/steam heated in centralized gas plants to commercial and residential buildings for space heating. 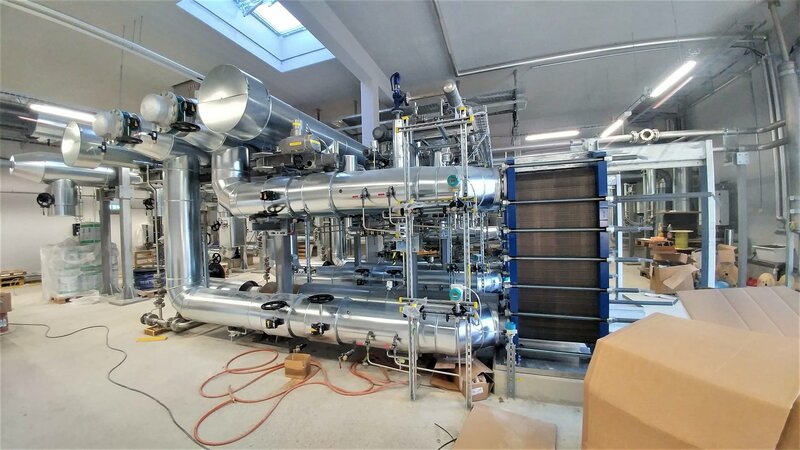 These systems can be adapted to carry geothermally-heated water, and Munich has set the ambitious goal of transitioning to 100% geothermal district heating by 2040, which they seem to be well on their way toward. Centralized district heating systems are rare in Canada, as many people heat their homes with individual gas or electric furnaces, or electric or water baseboard heaters. While the Western Canada Sedimentary Basin appears to possess similar hot water aquifers, a major challenge would be developing comparable district heating systems from scratch. While in Munich, I was hosted by Edwerk GmbH, a consulting company heavily involved in the exploration and development of many of the geothermal resources in the region. I learned a lot about the local geology from them, and had the opportunity to visit two geothermal sites under development. The first was an active drilling operation just outside the Munich city center, on the site of an operating gas-powered district heating plant (https://www.erdwerk.com/en/schaftlarnstrasse). 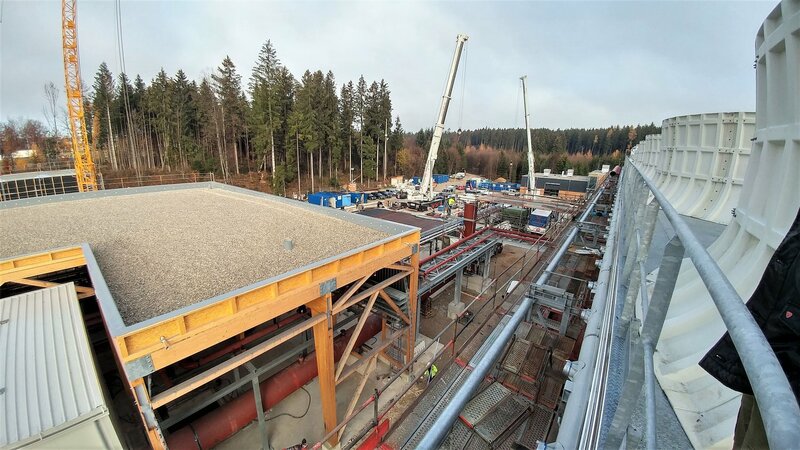 They have drilled to a depth of ~3 km to access water at about ~100˚C, and plan to connect the new geothermal system into the existing gas-powered district heating system. Having never been on an active drill site before, this visit was very informative for me, as I learned a lot about the drilling process, how progress of the borehole is tracked from the surface, and how the well is tested for its productivity. 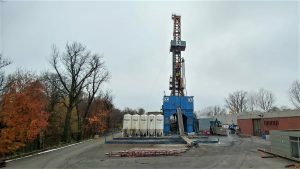 Image: The Schaftlarnstrasse geothermal drilling operation near the Munich city center. Electronics had to be turned off while on the drill rig, so this is the best photo I’ve got! 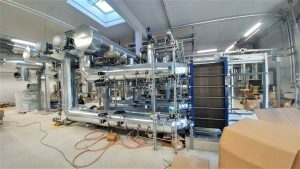 The second geothermal project I got a tour of was south of Munich in the town of Holzkirchen (https://www.erdwerk.com/en/holzkirchen). As can be seen in the cross section above, the temperature of the reservoir increases significantly to the south, but the reservoir also gets a lot deeper. The well itself reaches depths of ~5.1 km, making it the deepest in the Molasse Basin, and of its kind in Europe! 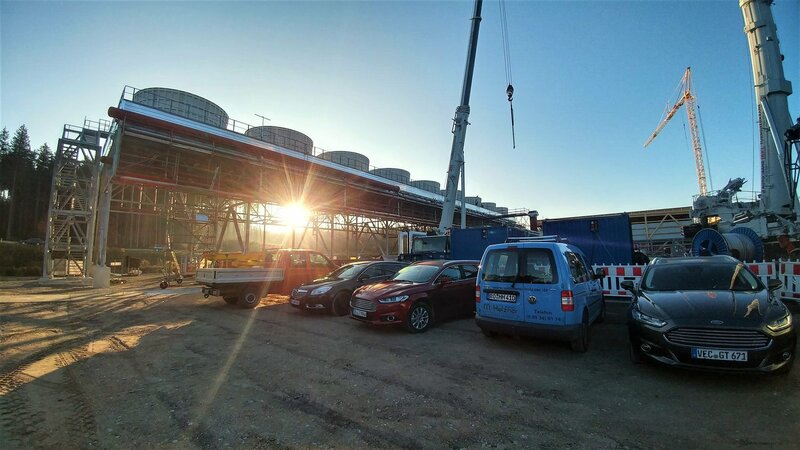 Because of the higher temperatures, the Holzkirchen project will actually provide both hot water for district heating and a modest amount of electricity. I was fortunate enough to get a tour of the facility, which was a hive of activity as they prepared for its first test operation, which occurred in December. To round out my time in Munich I took a day trip by train to the Bavarian Alps, about an hour south of the city, accompanied by a few Erdwerk employees. Once above the valley fog, we were treated to stunning views of the front ranges. I was immediately struck by how geologically similar these mountains and associated foreland basin are to the front ranges of the Canadian Rockies, which I have spent a fair bit of time in. It certainly made me think that if they can do geothermal here, we can probably do it in Alberta. 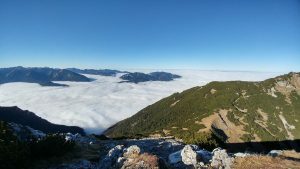 Image: View northwest from Bischof peak in the Bavarian Prealps. 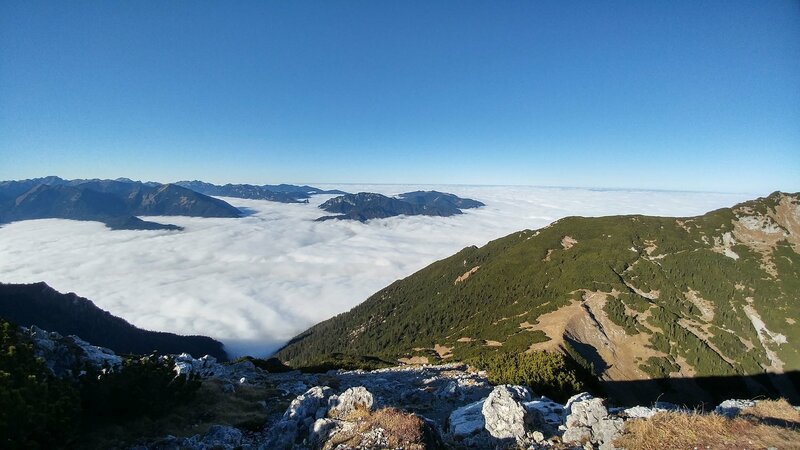 Munich is in the distance on the right, hidden beneath the fog. The geology, morphology, and vegetation of these mountains were very reminiscent of the front ranges of the Canadian Rockies. The final stop on my tour of Germany was at the GeoForschungZentrum (GFZ), a geological research institute in Potsdam, just outside of Berlin. Potsdam is located on the southern edge of the North German Basin (NGB), a large, deep (2-10 km), and complex basin with a protracted tectonic history spanning from the Permian to Cenozoic (330 million years ago to recent). The earliest origin of the basin is attributed to the downward flexure of the crust due to the Variscan orogeny, an ancient mountain building event that occurred in the Carboniferous Period (~330 million years ago). Following initial subsidence, the basin was affected by several phases of rifting and strike slip tectonics that caused many epidodes of uplift and subsidence and the development of numerous sub-basins. Compressive stress from the Alpine orogeny in the Cretaceous (150-60 mya) caused widespread uplift of the basin. Complicating matters is a 250 million year old layer of evaporite (salt), which has significantly deformed overlying layers via salt-tectonic processes. The NGB has a lot of potential for geothermal development, but is considered to be underutilized. Much of the geothermal resource is considered to be “petrothermal” as opposed to “hydrothermal”, which means that hydraulic fracking or shearing is required to create a geothermal reservoir in the otherwise impermeable hot rock. This type of geothermal project is known as an Enhanced Geothermal System (EGS), and I wrote a little about it in my previous blog post. A large part of the work conducted by the geothermal group at the GFZ is focussed on improving reservoir stimulation methods, and a key factor in this is constraining the mechanical properties of rocks, for which they have a large laboratory. Understanding the stress state at which a rock will shear or fracture is critical in engineering a geothermal reservoir, in which a balance must be struck between too little and too much connectivity between the injection and production well; too little and the water won’t flow, too much and it will flow too fast to heat up sufficiently. Image: Rock Mechanics Test System at the GFZ, used for determining behaviour of potential geothermal reservoir rock under stress. The expertise of my hosts at the GFZ lay in understanding the thermal properties of the lithosphere, including thermal conductivity of rock and the resulting heat flow. Understanding these factors is critical in assessing the amount of geothermal energy in a potential reservoir. Thermal properties of individual minerals are well known, but in a rock comprised of numerous minerals, the bulk thermal conductivity reflects a mix of conductivities, and therefore must be measured directly. Typically, thermal conductivity is measured directly by applying heat to a solid rock sample, via various methods, and measuring its response in a transient (while heating) or steady (once heated) state. Researchers at GFZ have tested a new approach wherein thermal conductivity of plutonic rocks is estimated based on the relative percentages of minerals present in a rock sample, and have shown that the results are consistent with traditional methods (see Fuchs et al., 2018). This method is exciting because it may allow for the estimation of thermal properties even when only drill cuttings (chips and fragments) exist. It is far cheaper, and thus more common, to obtain drill cuttings rather than intact cores, so this method has the potential to improve understanding of the subsurface temperature field dramatically. Another interesting area of research I learned about while at the GFZ, was the use of gas emissions as a geothermal exploration method. 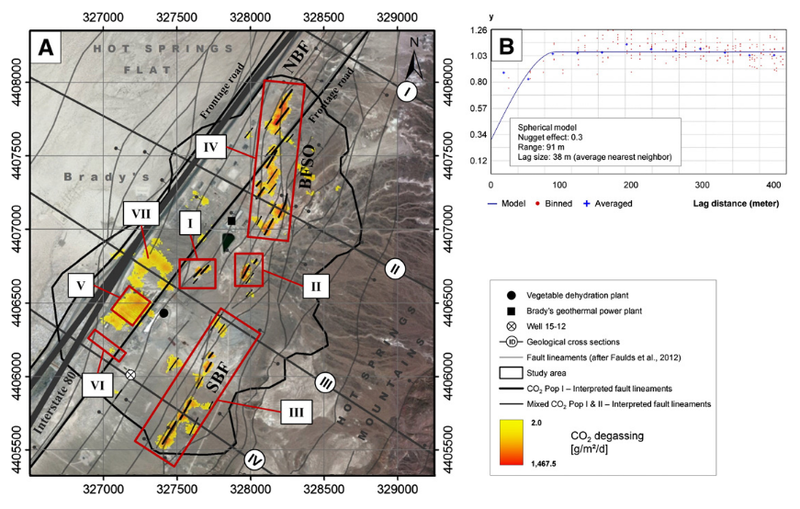 Researchers at the GFZ have demonstrated that elevated surface concentrations of carbon dioxide, hydrogen sulfide, radon, thoron, and gamma radiation correspond spatially to permeable fault zones through which geothermal fluids may also flow (see Jolie et al., 2015). Thus far, this has only been attempted in Nevada, where fault zones are known to be very active, and hot water and gas is very close to the surface. I would be curious to see if such a method would yield any noteworthy results in my thesis area in British Columbia. Image: Map of CO2 emissions near the Brady’s geothermal system in Nevada. Note how closely the anomalies match mapped fault traces. Source: Jolie et al., 2015. Farquharson, N., Schubert, A., and Steiner, U., 2016, Geothermal Energy in Munich (and Beyond): A Geothermal City Case Study: GRC Transactions, v. 40, p. 189–196. Fuchs, S., Förster, H.-J., Braune, K., and Förster, A., 2018, Calculation of Thermal Conductivity of Low-Porous, Isotropic Plutonic Rocks of the Crust at Ambient Conditions From Modal Mineralogy and Porosity: A Viable Alternative for Direct Measurement? Journal of Geophysical Research: Solid Earth, v. 123, p. 8602–8614, doi: 10.1029/2018JB016287. 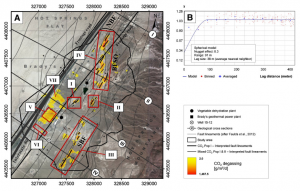 Jolie, E., Klinkmueller, M., and Moeck, I., 2015, Diffuse surface emanations as indicator of structural permeability in fault-controlled geothermal systems: Journal of Volcanology and Geothermal Research, v. 290, p. 97–113, doi: 10.1016/j.jvolgeores.2014.11.003. 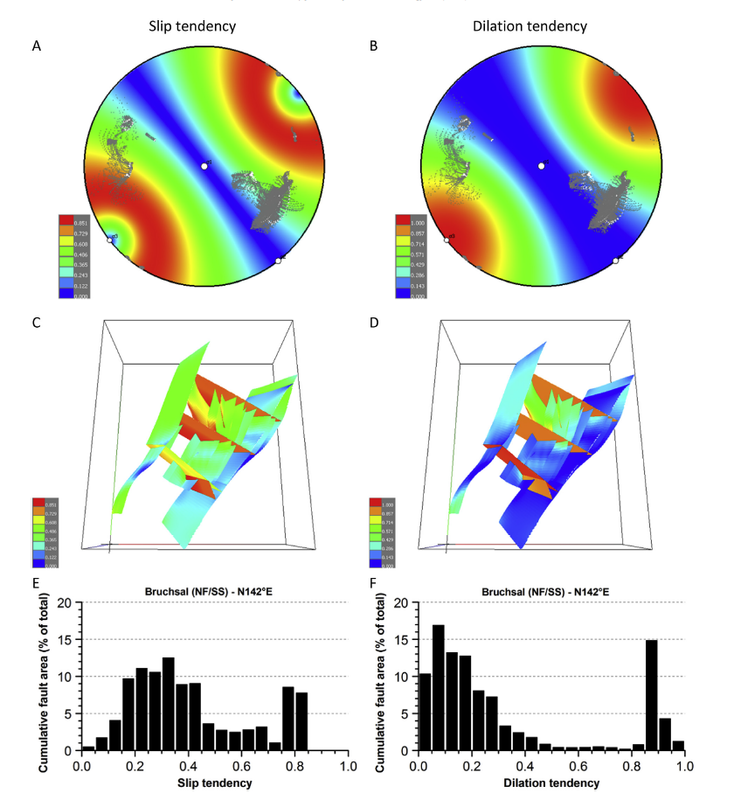 Meixner, J., Schill, E., Grimmer, J.C., Gaucher, E., Kohl, T., and Klingler, P., 2016, Structural control of geothermal reservoirs in extensional tectonic settings: An example from the Upper Rhine Graben: Journal of Structural Geology, v. 82, p. 1–15, doi: 10.1016/j.jsg.2015.11.003. 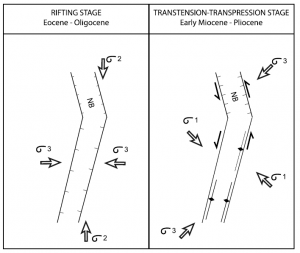 Rotstein, Y., and Schaming, M., 2011, The Upper Rhine Graben (URG) revisited: Miocene transtension and transpression account for the observed first-order structures: Tectonics, v. 30, p. 1–14, doi: 10.1029/2010TC002767. The Kimberley Foundation is a registered charity under the Society Act of British Columbia, Canada.